CLICK HERE TO OPEN AN ACCOUNT AT DRAFTKINGS! Welcome to our review of DraftKings, the one of the biggest and best daily and weekly fantasy sports sites on the web! Daily fantasy sports allows sports enthusiasts to pick a team and get paid after the games are over! "DK" has been kind enough to work out a special deal with us that allows RotoPicks readers a special 100% signup bonus up to $600 in free bonus cash! Simply enter promo code: ROTOPICKS after signing up through the link above and the bonus will be applied to your account! As with all daily fantasy website bonuses, your bonus cash is credited to your account in a time released fashion as you play. Deposit bonuses release in increments of $1 for every 100 Frequent Player Points (FPPs) that you earn by playing in paid contests. All deposit bonuses expire four months after they are created. DraftKings caters to both the novice and professional daily fantasy player. You can play for free in their freerolls (which offer prizes) to get a feel for the site, or play for real money from as little as a quarter ($0.25) all the way up to highroller action of $5,300 per game! DK offers daily and weekly leagues for NFL football, NCAA football, NBA basketball, college basketball Major League Baseball, NHL hockey, PGA golf, and even their new MMA daily fantasy games. You can play in leagues as small as head to head all the way up to thousands of players in Guaranteed Prize Pool Leagues (GPP's). Types of leagues vary including but not limited to: large guaranteed prize pool salary cap leagues, head to head, 50/50 (aka Double Ups), and more. Our favorite leagues are the double up leagues where you only have to finish within the top 50% to cash! 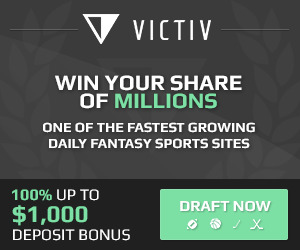 DRAFTKINGS.COM - CLICK HERE TO SIGN UP! Phone: No phone support at this time. Deposit Options: Paypal, Visa, Mastercard, American Express, Discover Card, DWOLLA. Signup Bonus: RotoPicks readers receive a special 100% up to $600! Minimum League Entry Fee: Offers free games. Cash games start at $0.25! Rewards Program: Offers DraftKings dollars for fulfilling affiliate deals with their list of advertisers, ranging from filling out surveys to signing up for services. DraftKings dollars can be used as real cash. Software: Can be played on all major browsers or through their mobile app via iOS platforms using iOS 7.0+ or Android. NFL: QB, RB, RB, WR, WR, WR, TE, FLEX, D/ST ($50,000). Notes: Significant Strikes are any Distance Strike or Clinch/Ground Strikes that are considered "Power Strikes" by official scorers. More Reasons to Open an Account at DraftKings: Occasionally offers re-deposit bonuses (Usually prior to each sport starting). You can set up special "private leagues" where you can play against your friends or co-workers. The owners of the site are hands on. They care. They listen to their members needs and this creates a better user experience. Offers online chat where you can converse with other fantasy football fanatics! View past performances by going to My DraftKings. Same goes for transactions involving your daily fantasy sports account. As you may have seen on TV or the Wall Street Journal, people are playing daily fantasy leagues for a living! Will you be next to have your name atop the leaderboards? Whether you're playing for fun or trying to make some easy cash, DraftKings has all you could ever want... and more! How to Expert Player Salaries to Excel - Adam teaches readers how to export player salaries to help you find value plays.